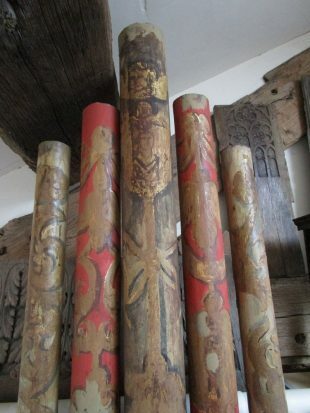 Chris Wells has been stripping the post-War brown paint and 1980 gilded decoration from the 1705 Chair Organ front pipes, and revealing and restoring the original finish. It resembles the painting on the 1684 Great front pipes, but in a notably more Baroque style. The faces on the shields are amusing – surely invisible from the floor of the original chapel and definitely from the floor of the Examination Hall.